OMAHA, Neb. (KMTV) — Dozens of dogs in Macon County, Tennessee are in need of new homes after being rescued from a hoarding situation. Macon County Animal control removed close to 40 dogs from the home of 59-year-old Gary Leary and his wife 46-year- old Jennifer Leary. The animals were found in cages filled with feces and were severely malnourished. Two of the dogs were dead. "They were not well taking care of very poor conditions. Some of them are very thin," said Jamie Weekly, Macon County Animal Control. "Never had human contact." The couple is charged with 38 counts of animal cruelty and the killing of livestock. Taysia Blue Husky and Malamute Rescue learned of the rescued husky mixes on social media. 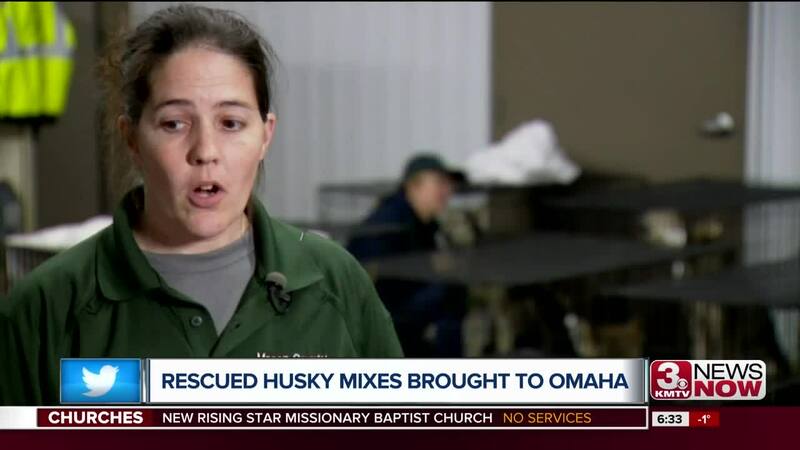 The Omaha animal rescue quickly took action and volunteers drove to Tennessee to bring some of the dogs back to the heartland for adoption. The round-trip journey was more than 1,600 miles to Omaha, but the volunteers say the trip was well worth it to bring 11 dogs back for adoption into forever homes. Ten of the dogs will be adopted out through Taysia Blue Rescue. A beagle/lab mix will be placed for adoption through Beagle and Basset Rescue of the Heartland . "They are thin. Their coats are not in great shape. They are all filthy," said Stephanie Konz, executive director, Taysia Blue Rescue. "But we will get them there." The dogs arrived late Tuesday night. Stephanie Konz of Taysia Blue says the dogs are already making themselves at home at Waggin' Tailz Ranch where they are being temporarily boarded. "That always chokes me up a little bit - when you see these guys come and they start to open up already," said Konz. "One of the dogs was so scared, you couldn't touch him. But last night, after we fed him some hot dogs he realized he was OK. He was safe." The dogs were vaccinated and micro-chipped. Next, they'll be spayed and neutered before going to foster homes and adopted out. You can learn more about fostering or adopting one of the dogs by clicking here .